Pioneers in the industry, we offer peon calling system, wireless nurse call system, remote calling bell, office peon calling system 6 remotes and cancellation, wireless nurse call system -10 remotes and wireless calling system - 9 remotes from India. Matching up with the ever-increasing requirements of the customers, our company is engaged in providing Peon Calling System. Banking on the skills of our qualified team of professionals, we are involved in providing Wireless Nurse Call System. 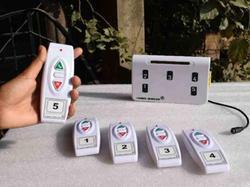 These nurse call system are capable of usage in multi bedded hospitals. Viz. 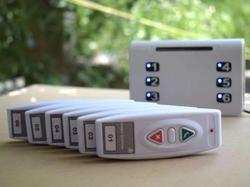 100, 250, or even 1000 bedded hospitals, use these nurse call system without any problem. 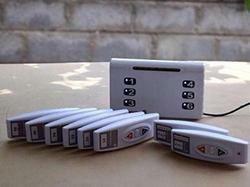 The 6 remote office peon calling system is specially designed for small and medium offices. It had 6 remote controllers. Officers can use the remote to call the peon. Peon has a receiver with 6 indicators on it. Which officer is calling is visible on the receiver along with buzzing alert. Peon after attending can cancel the call from either officer’s room or from an extra remote. We provide this extra 2 remotes to cancel the call. Each remote has 3 buttons, one of each calling remote. 6 remote wireless office peon calling system6 different office clerks can use the 6 remote to call peon. Peon carries 2 extra remotes. Peon can cancel the call by the cancel button. The calling party can also cancel the call from his end. 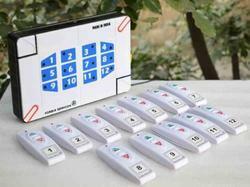 The peon can also cancel the called numbers by the 2 extra remotes that he has with him. We The range of communication is 20-30 meters within indoor operating conditions. In open line of sight the operating range is 100-120 meters. 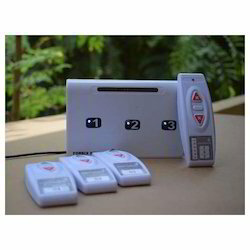 Remote controller signals can pass through multiple concrete walls. 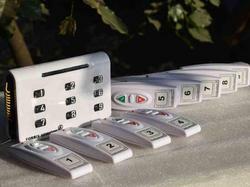 The wireless remote controllers operate on RF (radio frequency) technology. It operates on 12 V DC (model: 23 A) battery. It therefore, provides sufficientpower to penetrate through the concrete walls. The receiver unit operates on 12 V DC adaptor. The receiver can operate on external 12 Volt battery also. The external battery needs to be at least 4-6 Ah/12 V DC. Hence, it can support 8-10 hrs of operating time. Moreover. machine has aesthetic looks and gels well with the office furniture and walls. 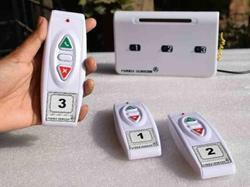 The wireless nurse call system is best suited for small, medium and big size hospitals. The system is scalable from 10 and expandable to more than 1000 bedded hospitals. 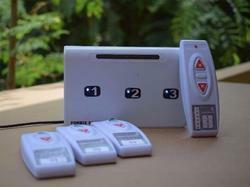 Every patient has a remote controller call button in his hand or fitted to the bed. When he presses the remote, corresponding bed number shows up on nurse station. 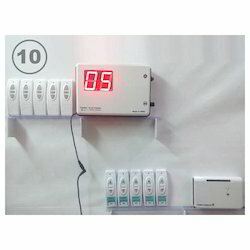 This accompanied with buzzing sound to alert the nurses on duty.This particular nurse call system set consists of 10 remotes, 1 nurse station and a booster. Remote controllers are battery operated and the rest of the parts run on power supply. 2 nos. of necessary adapters comes along with the set for the nurse station and booster.The range of communication is 20-30 meters indoors. Repeater (booster) helps increasing the range even further. 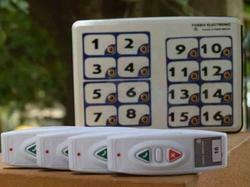 This particular nurse call system comprises of 10 remotes, a receiver, a booster. Receiver console (nurse station) and repeater (booster) operates on power supply. We supply necessary adapter along with to fit in 110 V-220 AC main supply. The remote controllers operate on battery. The batteries last for no less than a year. Customers are using remotes without battery discharge for more than even 4 years. The range of communication is 20-30 meters within indoor operating conditions. In open line of sight the operating range is 100-120meters. Remote controller signals can pass throughmultipleconcrete walls. 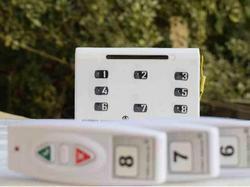 The wireless remote controllers operate on RF (radio frequency) technology. It operates on 12 V DC (model 23 A) battery. It therefore, provides sufficient power to penetrate through the concrete walls. The receiver unit operates on 12 V DC adapter. The receiver canoperate on external 12 Volt battery. The external battery needs to be at least 4-6 Ah/12 V DC. Hence, itcansupport8-10 hrs of operatingtime. Moreover machine has aesthetic looks and gels well with the hospitalfurniture and walls. 3 different office clerks can use the remotes to call peon. Peon carries an extra remotes. Peoncan cancel the call by the cancel button. The calling party can also cancel the call from his end. We The range of communication is 20-30 meters within indoor operating conditions. In open line of sight the operating range is 100-120meters. Remote controller signals can pass throughmultipleconcrete walls.The wireless remote controllers operate on RF (radio frequency) technology. It operates on 12 V DC (model 23 A) battery. Ittherefore, providessufficientpower to penetrate through the concrete walls.The receiver unit operates on 12 V DC adaptor. The receiver canoperate on external 12 Volt battery. The external battery needs to be at least 4-6 Ah/12 V DC. Hence, itcansupport8-10 hrs of operatingtime.Moreover.machine has aesthetic looks and gels well with the office furniture and walls. The IP PBX series allows businesses to unify multiple communication technologies, such as voice, video calling, video conferencing, video surveillance, data tools, mobility options and facility access management onto one common network that can be managed and/or accessed remotely. 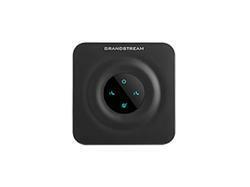 Grandstream UCM series helps your business to run faster and enjoy benefits of ROI. Our IP PBX systems can change the way that business operate by providing unlimited access to extensions calling from anywhere in the world. Customer experienced high-defined voice quality when calling employees to have the flexibility to carry their extensions along with them. Designed to provide a centralized solution for the communication needs of businesses, UCM6204 IP PBX appliance combines enterprise-grade voice, video, data, and mobility features in an easy-to-manage solution. This IP PBX allows businesses to unify multiple communication technologies, such as voice and video calling, video conferencing, video surveillance, data tools, mobility options and facility access management onto one common network that can be managed and/or accessed remotely. • Built-in Call Detail Records (CDR) for tracking phone usage by line, date, etc. Designed for users looking to connect their analog devices to a VoIP network at home or in the office. The HT802 is a powerful analog telephone adapter that is easily deploy-able and manageable. It comes equipped with 2 FXS ports to create a high-quality network solution. The HT802 is a analog telephone adapter (ATA) is mainly focused to connecting the standard telephone to network or computer so users can get the benefits of internet calls or IP telephony. The HT802 delivers powerful VoIP technology and routing capabilities to home and office environments, and allows users to successfully connect their analog devices to a manageable and powerful VoIP network. Built upon Grandstream’s market-leading SIP ATA/gateway technology, with millions of units successfully deployed worldwide, this powerful ATA features exceptional voice quality in various applications and environments. The HT802 comes with 2 easy-to-use FXS ports, state-of-the-art encryption with a unique security certificate per unit, automated provisioning for volume deployment and device management and outstanding network performance. The GXW4108 FXO IP Gateways series offers the small enterprise, SOHO, remote offices and multi-location enterprises a cost-effective, easy to deploy VoIP FXO solution. 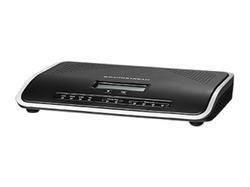 The GXW4108 allows any business to seamlessly connect devices within an office or multiple offices with up to 8 PSTN lines, to an IP PBX system, or with an existing traditional phone system. The GXW4108 FXO gateway series enables businesses of all sizes to create an easy-to-deploy VoIP solution. These FXO gateways offer the ability to seamlessly connect multiple locations and all devices within an office to any hosted or on premise IP PBX network to make deployments as easy as possible. 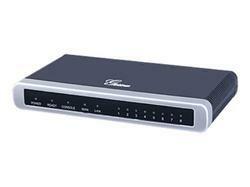 The GXW4108 includes 8 FXO ports, 2 10/100 Mbps ports and supports SIP video through the H.264 codec. Advanced telephony features, easy automated provisioning and superb voice quality allow the GXW4108 series to be the ideal VoIP gateway for businesses. control of lights, fans and other electrical appliances using your smart phone. any additional rewiring. 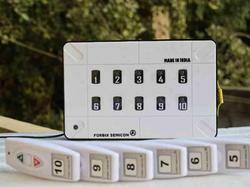 firefly easily fits inside your switchboards. advantage of this is that of making your presence felt even when you are not home. simultaneously using the 'Firefly Connect' app on their smart phone. harmoniously with the 'Firefly Connect' app. network in the future as per your requirement. 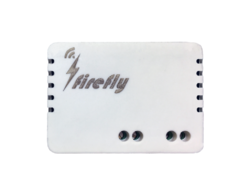 Automate your home and step into the world of 'Internet of Things' (IoT) with firefly. 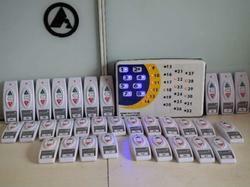 Visit our website www.fireflyautomation.in for more information. Looking for Wireless Calling System ?